The most notorious fraudulent investment scheme in History was born at Boston. A Ponzi Scheme occurs when an unrealistic investment return is promised to a group of investors, and then a 2nd group is used to pay off the 1st group. After fantastic returns are publicized, even larger groups are recruited to pay the earlier groups. The intention is to NOT invest the capital, but to defraud investors with wild promises, and then skip town. 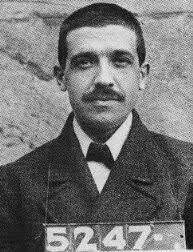 In 1919, Charles Ponzi devised a scheme of trading international pre-paid postal reply coupons. Postage for such coupons had been set at a fixed exchange rate in 1906. World War I devastation had devalued many currencies. Ponzi converted dollars into devalued currencies, then bought postage coupons at this 1906 fixed rate. If the value of a foreign currency had dropped by 60%, then Ponzi could buy American stamps at a 60% discount and subsequently sell them somewhere else at face value. Ponzi initially recruited his friends to invest in postal coupons. He offered a 50% return in 45 days, and a 100% return in 90 days. With this start-up money, he created the Securities Exchange Company. He paid fantastic returns to the early group of investors by using the funds received from later groups of investors. By February 1920, his profit was about $5,000. By March, it was about $30,000, a huge sum at that time. In May, it was about $420,000, and by July it was in the millions. From an accounting perspective, Ponzi's company did not generate any income, it just kept receiving and dispersing capital. A small lawsuit by one investor raised doubt about the scheme, which caused many investors to cash in their stock in the company. A positive article in the July 24th 1920 edition of the Boston Post caused a massive run, with about $2 million redeemed by Ponzi during the next few weeks. In August, federal agents raided his offices and shut down the company, and Ponzi was arrested for 86 counts of fraud. If Ponzi's company had truly invested all of its capital, it was estimated that 160,000,000 postal reply cards had to be in circulation at that time, while in reality less than 30,000 circulated. It is believed he defrauded about 10,000 investors out of $10,000,000. Ponzi pled guilty to mail fraud charges and spent 3 years in Federal Prison. He also spent 9 years in State Prison subsequent to that. He was deported to Italy in 1934, and died in Brazil in 1949 at about age 67. 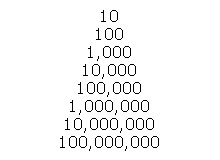 A Ponzi Scheme is also known as a Pyramid Scheme. In the table below, 100 investors have to pay the first 10 investors, then 1000 investors have to pay these 100 investors, etc., etc. Such schemes usually last only weeks, as the growth is exponential.